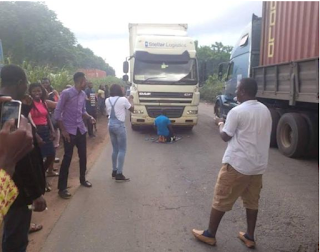 A mild drama played out on Friday after a driver parked his truck in the middle of the Ore -Ijebu Ode highway to pray, causing a major gridlock. The Muslim driver, after alighting from his vehicle, spread his mat in front of the truck and prayed. As a result, a heavy gridlock built up and travellers who were caught up were seen taking photos of him as he prayed on. This Muslim is a terrible religion. I wonder what they are made of. Bundle of useless fellows and dafts .